Rinse and remove stem from kale. Pat dry with towel. Tear into large 2-3″ pieces since they shrink a lot when dehydrated. 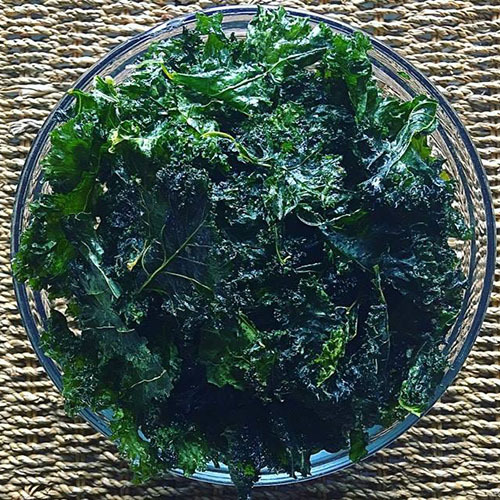 Place kale “chips” in a large bowl and add coconut oil. Massage oil into all areas of every leaf. Add vinegar and toss to coat each “chip.” Add salt and toss again to coat each “chip” evenly. Place “chips” on dehydrator trays. Dehydrate for 6 hours at 115° F.
Combine flour, sugar, salt and baking powder in a mixing bowl. In a small bowl, whisk together egg, vinegar and water. 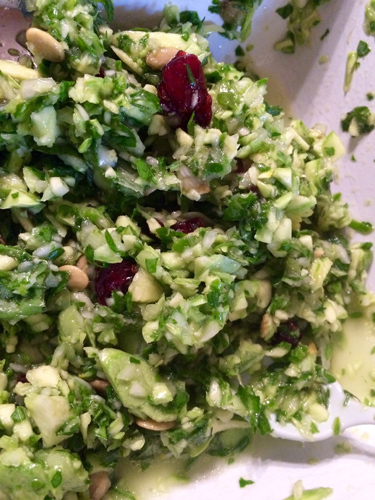 Cut in about 2/3 cup cold coconut oil or shortening into dry ingredients until mixture is crumbly. Pour in egg mixture and mix until dough ball forms. Add more water or flour to get desired dough texture. Divide dough in half. Place dough ball onto a lightly floured surface. Roll out dough until about 1/4″ thick. 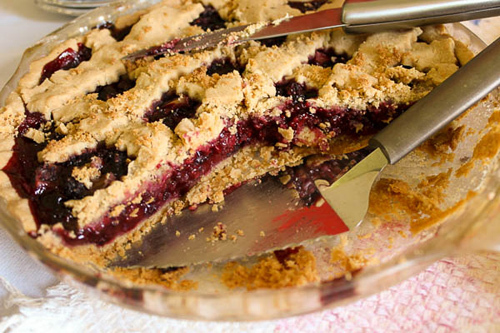 Gently lay pie crust into a 9″ pie plate. Reserve the remaining dough for the top of the pie. After pie has been filled, roll out remaining dough and cut as desired for topping: lattice, whole, shapes, etc. Combine berries, rhubarb, sugar and flour in a large bowl. Pour into uncooked pie crust. Add remaining 2-3 tablespoons coconut oil or shortening on top of berries in little pieces. Top with remaining pie crust if desired. Brush top of pie with coconut milk. Bake at 350 °F for about 50 minutes. Filling should be bubbly and crust should be slightly brown. If edges of pie start to brown too quickly, cover with foil. Let pie cool about 10-20 minutes before cutting and serving. Note: Got leftover pie crust? Form together and roll out again on a floured surface. Cut or shape as desired. Place crust pieces on a large cookie sheet and sprinkle with sugar and cinnamon. Bake at 350 °F for about 10-15 minutes, or until golden brown. Enjoy with home made ice cream. Recipe here. 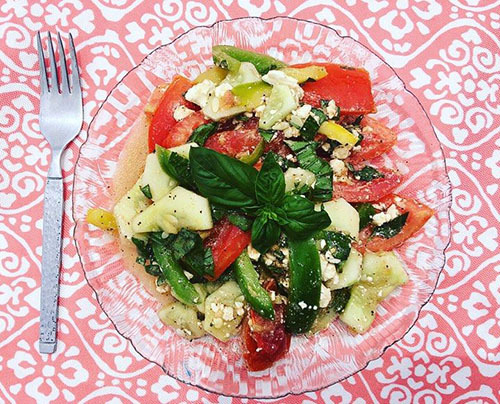 Courtney from Columbus, KS won $50 for this recipe and photo! Submit yours here! Clean herbs and place in blender. Add remaining ingredients and puree. Adjust seasoning for spice if needed. This sauce is great as a dip for grilled meats or veggies, or mixed with mayonnaise for a sandwich spread. Cheryl from Carbondale, Illinois won $50 for this recipe and photo! Submit yours here! In a small bowl, combine honey, orange juice, coconut water, balsamic vinegar, ginger and cilantro. In a large skillet (or other preferred cooking method), heat coconut oil over medium heat. Place salmon filets in skillet and sprinkle both sides with a little salt and pepper. 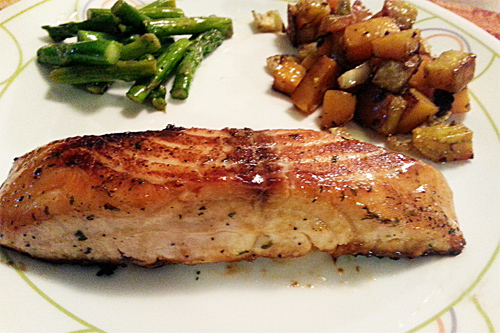 Pour honey ginger mixture over salmon and continue to sear until both sides of the fish are starting to brown. I usually cook mine about 6 minutes per side, depending on how thick the salmon is. 1. 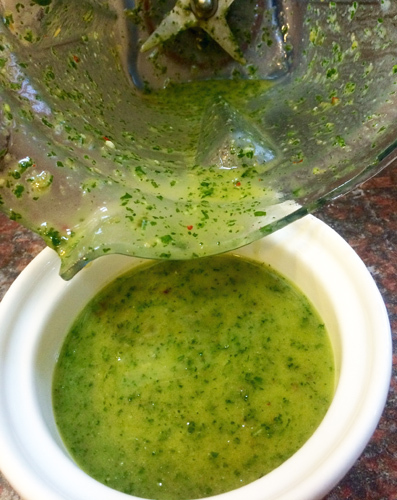 Make the flavor mix: over medium heat melt butter and coconut oil with water, salt, pepper, parsley, and 1 teaspoon chicken seasoning. Depending on how much chicken you have you might need more or less of this. Set aside to cool. 2. Beat eggs, vinegar, milk and 1 tablespoon flavor mix together. Set aside. Mix coconut flour, einkorn flour, 1 teaspoon chicken seasoning and a pinch or two of black pepper together. Pour onto a plate. Set aside. 3. Add 1 cup chicken at a time to a food processor with 1 tablespoon of einkorn, 1/2 tablespoon flavor mix, 1/2 tablespoon milk, and red pepper. Blend until chunky (not too smooth). Empty into a bowl until all chicken has been mixed by repeating the process. Chicken mixture should be sticking but thick enough to hold together. 4. Work chicken into golf ball sizes, dunk first in milk bath coating all sides, then dunk in flour coating. Press down on nugget slightly to create a flatter nugget as you coat both sides. Set on a plate and repeat until you have enough to start cooking. 5. Heat palm shortening and coconut oil to medium-high heat. We prefer 3/4 palm shortening and 1/4 expeller pressed coconut oil for frying. Use just enough for nuggets to float. Slowly add nuggets to oil, enough to fill pan without crowding. Adjust heat as needed. 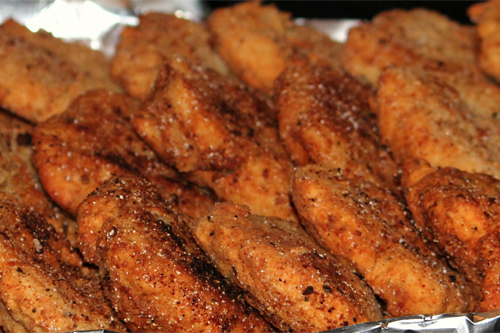 After 1-2 minutes, flip nuggets with a fork and continue cooking until done. 6. Drain and cool nuggets. 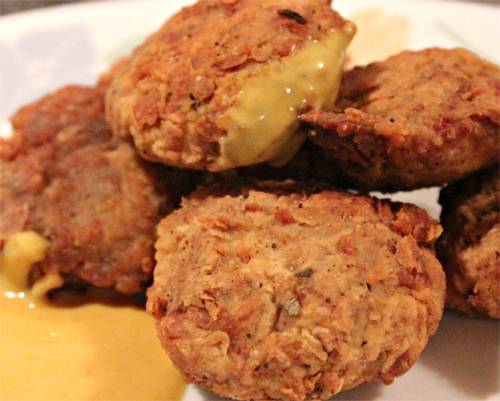 Serve with your favorite dipping sauce such as honey mustard, ranch, BBQ sauce, ketchup, etc. and enjoy! Cheree from Allons, TN just won $50 for this recipe and photo!